The Cuban regime has survived three major pressures for change in the last two decades: the democratic wave that swept both left- and right-wing dictatorships in Latin America in the 1980s; the demise of the Soviet Bloc in the late 1980s; and a major economic depression at home in the 1989-1994 period. The continuity of the political regime (see Suchlicki 2000, Domínguez 1993) has amazed most Cubanologists. Although politics in Cuba changed little in the 1990s, the economy on the other hand changed a lot. Between 1993 and 1996, the Cuban government opened several sectors to foreign direct investment, liberalized farm markets, legalized dollar-holding and some forms of self-employment, and reduced the fiscal deficits by cutting spending. Compared to reforms elsewhere in Latin America, the Cuban reforms were timid in scope. Cuba fell short of privatizing any state-owned enterprise, permitting full-scale profit making, and liberalizing many markets to domestic investors, as many Latin American nations did in the early 1990s. But compared to the Revolution’s own past, the reforms were profound. The few sectors that were targeted for reform actually underwent profound change. Economically, therefore, the Cuban regime displayed a combination of both deep reform and reform avoidance. It introduced substantial change in some areas, but it also acted cautiously by exempting many sectors from reform. This paper seeks to provide an explanation for these two puzzles—the survival of Cuban regime, and the combination of change-seeking and change-avoidance in economic policy in the 1990s. It makes two central points. First, the dual nature of reform in Cuba is explained by the interplay between hard-liners and soft-liners at the top level of government. Castro in 1994 faced competing, mutually exclusive political demands: important sectors of the ruling party demanded reform, whereas others demanded no reform at all. The dual outcome of the reforms is the result of an Executive Branch seeking to carry out a balancing act between these two groups. Second, and more important, the dual nature of economic reforms helps explain the survival of the regime, for two reasons. First, the reforms served to deflate, in fact, completely fool those actors that in the early 1990s were pressuring for deeper economic and political opening. The reforms allowed the state to give the impression that the regime was moving toward the market—a type signal that was necessary to placate the pressures coming from reform demanders—when in fact, the government never intended to move in that direction. Instead, the government intended to side with the hard-liners, but this was only possible after sufficiently placating those pressuring for change. The reforms allowed the state to fool the reformers while simultaneously boosting the hard-liners. The second reason is that the reforms, however limited, actually magnified the power of the state by enhancing its capacity to dispense inducements and constraints. It is normally believed that economic openings hurt incumbent politicians, and in the end, undermine authoritarian states in general. In Cuba, the opposite happened. The reforms were carried out in a manner that enlarged the leverage of Cuba’s incumbents over society. They allowed the state to become the gatekeeper of a new and highly valuable commodity in the economy: the private, externally connected sector. By becoming the gatekeeper, the state has increased the payoff of cooperating with it: loyalty is rewarded by receiving access to this sector. In many ways, the Cuban state has transformed the way it interacts with society: while the number of winners is decreasing, the reward that actors obtain for endorsing the state is becoming more valuable. Incumbents in authoritarian regimes in general, especially in one-party authoritarian regimes, stand a better chance of surviving internal and external shocks than in democracies. Bueno de Mesquita, Morrow, Siverson and Smith (2000) argue that this phenomenon is explained by the differences in size of the winning coalition, defined as the members of the population whose support is essential for the survival of the regime (see also Geddes 1999). Incumbents in democracies require, by definition, large winning coalitions, at least large enough to win the necessary votes over those of their rivals. Incumbents in authoritarian regimes, by definition, do not require large winning coalitions to stay in office. They are sustained by a small size of the population. To stay in office, incumbents in both democracies and authoritarian regimes must do the same: please or reward their winning coalition with “things of value.” Precisely because winning coalitions in authoritarian regimes are smaller, pleasing them is easier, or less costly to the incumbents. So, in the context of a huge crisis, the incumbents in authoritarian regimes will still find enough pork to please the small winning coalition. In one-party dominant authoritarian regimes, the incumbents enjoy “greater political resources”: they can use bureaucratic privileges for recruiting a minimal number of subordinates (Haggard and Kaufman 1995:13). If the winning coalition were larger, as is the case in every democracy, it would be harder to find sufficient “things of value” for the entire coalition. In principle, therefore, it is easier for authoritarian regimes to maintain the loyalty of the core group during economic crisis than it is for democracies. With fewer favors, they can achieve far greater loyalty among the reduced number of actors that support them. Cuba certainly qualifies as an example of small winning coalition regime. The pillar of the regime includes three selective groups: the party (with a membership of 600,000 in a country of 11 million), the top echelon of the military, and the security apparatus (Suchlicki 2000). As long as enough “things of value” can be provided to these actors, which is not too costly given that this is not a large group, the loyalty of this core group can be preserved, even during harsh times. In their model about the survivability of authoritarian regimes, Bueno de Mesquita et al. fail to consider the possibility of internal splits within the winning coalition. Other theorists have convincingly shown that deep economic crises in general tend to create divisions among incumbent forces, whether democratic or authoritarian. The incumbent leadership will split regarding how best to respond to the crisis. Essentially, the split occurs between soft-liners (proreform) and hard-liners (reform-adverse) (see Przeworski 1991, Haggard and Kaufman 1995; Corrales 2000). In authoritarian regimes, the split can occur along yet another dimension: what to do politically? Again, the incumbents will split between those favoring political opening and those seeking hardening (O’Donnell et al. 1986). Although the incidence of splits is less likely in single-party authoritarian regimes as opposed to military or personalistic regimes (see Geddes 1999; Haggard and Kaufman 1995:11- 13), these splits have nonetheless occurred in one party states such as Mexico, Korea, Taiwan, leading to regime change (Solinger 2001). In the 1990s, Cuba’s winning coalition did not split over the issue of politics—a consensus on preserving single-party dominance seems to have prevailed. Yet, it split significantly over economics. An important part of the Cuban leadership lobbied Castro on behalf of significant market opening. At the 1991 party congress, which took place shortly after the demise of the Soviet bloc and in the midst of recession, these pro-reformers achieved more vocal and prominent positions of power (see Miami Herald 9/28/92:12A), constituting an internal focus of pressure. Pressure for economic reform also came from external actors. The literature on economic reform stresses that in conditions of economic crises, incumbents are desperate to recruit new external allies or favors. Cuba’s potentially new external allies became all the more insistent on the need for economic reform. One such set of allies included countries in Western Europe (see Roy 2002), and to a lesser extent, Latin America. Some of these external actors themselves were engaged in deep market reforms (e.g., Spain and Mexico) and wanted Cuba, at the very least, to do the same. They were eager to invest in Cuba, provided more market facilities were granted. Foreign investors—another set of sought-after allies whom Cuba desperately needed to lure in order to ease the island’s investment deficit—were also clamoring for economic reforms. Cuba desperately needed capital: its capital stock depreciated over a decade and no new investment had taken place nor was possible (Zimbalist 2000:21-22). Hungry for diplomatic allies and, increasingly, external investors, Castro simply could not afford to disregard the view of these external actors. Finally, pressure also came from society at large. In the early 1990s, Cuba entered into a severe depression, which took a heavy toll on citizens’ livelihoods. Food consumption levels, to mention one indicator, plummeted from 3,109 calories a day in 1989 to 2,357 by 1996, a dramatic 24 percent drop in calories in a space of a few years (Cubanalysis n.d.). The regime had justifiable reasons to fear urban riots. Offering some relief to society was imperative. Thus, by 1993, Fidel Castro faced two competing and mutually exclusive sets of political pressures. On the one hand, a majority within the winning coalition wanted to entrench the status quo (the hard-liners). On the other hand, a not insignificant part of the winning coalition (including both domestic and external actors) and societal groups, called for reforms (the pro-reform group). How did the Cuban state react? The Cuban state faced a dilemma. Reforms were necessary to please a growing component of the domestic winning coalition, to court a large component of external actors, and to placate domestic anguish. Yet, reforms risked alienating the largest sector of the winning coalition, the hard-liners. This alienation could occur in three ways. First, hard-liners could feel politically abandoned, seeing their views ignored by Castro. Second, hard-liners would feel the costs of reforms more profoundly. Liberalization entailed shrinking the size and prominence of the state, an this meant reduced prerogatives to those who managed state offices, mostly hard-liners (Pérez-Stable 1999). Third, the reforms would increase the power of political rivals by promoting the rise of new, possibly wealthier, societal actors (self employed, new capitalists, new business groups, new labor associations, new savers). By empowering civil society, reformers can undermine the monopoly of political power held by hard-liners in authoritarian contexts (see Feng 2000:204). The duros thus hated glasnost and perestroika, in vogue in the Soviet world in the 1980s. They possibly gave Castro a warning along these lines: “if you liberalize, compañero Fidel, your political base, tenuous as it is, will become even shakier. You will unleash unpredictable forces, and worse, we will abandon you.” For Castro, it was risky to dismiss the duros. The duros were, after all, the most die-hard loyalists of his regime. Castro simply could not afford to forgo their support at a time when every other pillar of the regime was crumbling. The dilemma confronted by the authoritarian state is that reforming was necessary as a way to soften the crisis and placate the ever-larger political pressure for change, but it undermined the very same group that acted as the most reliable pillar of the regime. Castro needed to make a decision, and a quick one: by 1993, the economy continued to plunge, showing no signs of recovery. Pro-reformers argued that reforms were urgently needed to prevent the ship from sinking; the duros argued that the time was not right to loosen things up. It is not easy to gauge the political divisions within the top echelon of the Cuban government, a regime that is well known for its hermetic internal politics. Assessing internal politics is even harder in a country that lacks a free press and whose government is keen on always portraying an image of unity. Yet, theoretical analysis and anecdotal evidence suggests that the economic crisis and the process of economic reforms produced internal divisions within the Cuban cabinet. Albeit imperfect, one way to discern this is to examine the number of new entrants into the cabinet. Most theorists of presidential politics agree that new policies come with new ministers. This is so because new policies require new leaders with new convictions and new energy to promote the changes (Domínguez 1997). There is no question that the 1993-96 period—unquestionably the most policy dynamic in years—was characterized by a significant degree of new entrants into the Executive branch. Up until then, changes in the Cuban cabinet were for the most part modest. Between 1987 and 1992, for instance, there were a total of 20 cabinet changes, amounting to approximately 3.33 changes per year (in a cabinet that included 33-34 positions).2 In terms of economic policy orientation, this period was characterized by one of the most hard-line in Cuba, which some analysts have described as the return to totalitarianism after a brief transition into a softer post-totalitarian regime (Mujal-León and Busby 2001).3 This cabinet stability ends in 1993-96, coinciding with the period of major policy change.4 Between 1993 and 1996, there were 25 cabinet changes, peaking in 1994/95, with 10 changes in that year alone. Two points are clear. During the high reform period of 1993-96, Castro did not hand over the cabinet entirely to newcomers. The cabinet remained under the control of the pre-1992 class.” Nevertheless, the space provided to newcomers was not miniscule either. Newcomers captured almost half of the cabinet, including crucial positions (e.g., foreign relations, economy and planning). It is possible to assume that the balance between the “pre-1992 class” and the newcomers represent a rough estimate of the balance between the duros and the reformers. I recognize the risks behind this assumption. It is conceivable that some of the newcomers were not that much more committed to reforms than the old guards, or that the some of the old-guards might have been pragmatists amenable to accepting the new changes.5 Some reports suggest that these are indeed new technocrats, or perhaps, “communist technocrats” (Cubanalysis 2000). The only way to confirm this is to conduct interviews. In the absence of that, I will need to rely on a well accepted theoretical assumption. The policy orientation of hired ministers ought to reflect the policy direction of the period of recruitment. It is unlikely for an Executive chief to recruit newcomers whose views go against the official policy. Cuba’s official policy in 1993-96 was precisely the pursuit of some marketfriendly reforms. Thus, the class of 1993-96 must have been quite sympathetic, or at least comfortable with, such a policy stand. Otherwise they would not have been appointed. 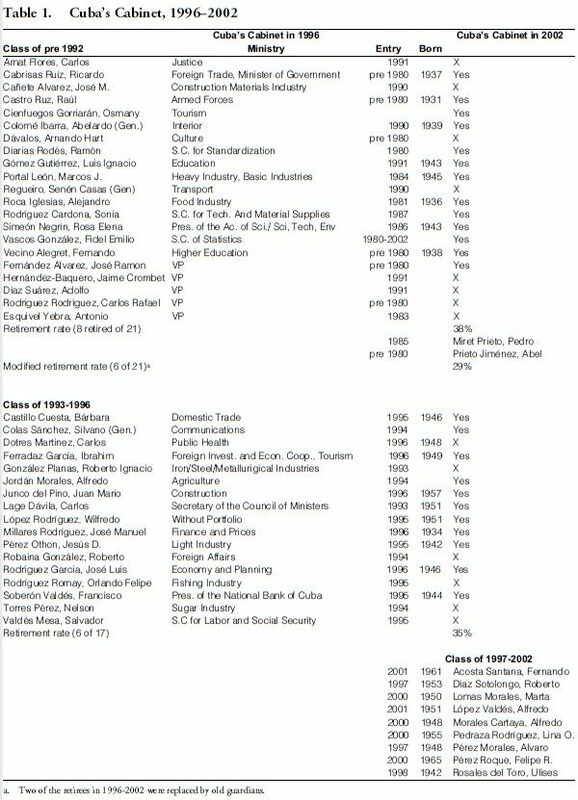 One can now conclude that the Cuban cabinet became severely split in the 1993-96 period between reformers (the newcomers) and duros (the pre-1992 class). Which side did the Chief Executive take? The common view is that, at least during this period, Castro sided with many of the reformers, who were believed to have had the upper hand, at least until the 1996. A closer look at the reform process reveals that quite the contrary, the duros were probably achieving the greatest influence. • Economic reforms are delayed as long as possible for reasons that are hard to justify economically. • Once reforms are unavoidable, the authorities proceed to reform by simultaneously creating “power reserves” for the hard-liners. Power reserves means domains of policy that remain under control of the hard-liners. • As soon as the economy begins to show signs of improvement, the Executive discontinues (rather than deepens) the reform process. Fidel Castro’s approach to economic reforms meets each of these patterns. I discuss each in turn. Pressure for reform peaked by 1990-91. At that point, it was clear that the economy was in a tailspin and that external aid from the collapsing Soviet Union would not be forthcoming. There is evidence that at the 1991 party congress, members of the politburo ardently debated the need for reforms. Yet, the Party Congress decided not to make any major economic changes. Other than announcing austerity (i.e., more rationing of food), what came to be called as the “Special period,” and approving a few symbolic political changes in 1992, no major reform initiatives were launched (Font 1997).6 The hardline policy of 1986, in which self-employment and property-transactions were limited and street vendors were banned, was continued. Although the government recognized the need for private foreign investments (allowed by law since 1982), very few important foreign investments took place. In mid 1993, when Cuba hit its fourth consecutive annual GDP contraction and deepest economic trough yet, the government realized that it had no option but to begin to liberalize. At this point, the pressure for reform was at its highest, both economically and politically. The economic numbers showed no signs of improving, and the domestic and external actors demanding change became all the more insistent. Bowing to this pressure, Cuba launched far reaching reforms starting in mid 1993. Yet, the pattern of liberalization conformed with the “power reserve” hypothesis. Efforts were done to please the hard-liners by guaranteeing them new sources of power. In reviewing Cuba’s economic policy in the 1980s, Cruz and Seleny (2002) argue that a crucial objective of the government was to assert the power of the party- state, over that of technocrats and market actors. The few market openings that occurred in the late 1970s came to an abrupt close in 1986, despite the economic gains achieved. The reasoning was: if the market were allowed to determine everything, Castro wondered, what would be left for the party to administer. Thus, despite the economic stagnation that ensued from 1986-90 (Roque Cabello and Sánchez Herrero 1998), the state maintained its anti-market policy until 1993. By 1993, as the reform pressures peaked, Castro was compelled to do something. The optimum strategy, from his point of view, was to introduce the least amount of reform in order to placate reform-demanders and still not alienate hard-liners. The solution was to introduce an uneven process of market reform: liberalize selectively, and in those sectors that were liberalized, introduce substantial state-based restrictions. This led to an odd pattern of reform. Some areas were opened, in order to please the pressure group that most actively called for this change, but in the end creating sufficient restrictions, in order to please the non-reformers (See Pastor 2000). Appendix 1 provides detailed examples of the restrictions in agriculture, foreign trade, monetary policy (dollarization), self-employment, the private sector, and telecommunications. These are the areas typically considered subject to the largest degree of opening. Yet, the restrictions imposed were quite substantial. Cruz and Seleny (2002) label this “segmented marketization.” I propose instead: stealth statism. Behind the pretense of market reforms, the Cuban government managed to introduce new opportunities for the state to impose penalties. The point of this opening and restricting style of economic reform was twofold. First, the government managed to create the illusion in 1993-96 that Cuba was indeed committed to market change. This was necessary in order to alleviate the pressure for change. The reforms served as a fooling device. Economists and political scientists agree that economic policy can often be used by governments to issue signals. Governments can announce audacious policies (“overshooting”) for no reason other than to send a signal of commitment: the more audacious the policy announcement, the more likely it is that skeptics will begin to think that this government is serious. The higher the credibility deficit faced by the government, the more likely it will rely on signaling devices. Latin American presidents in the early 1990s did this precisely because investors did not believe their intentions to enact reform. Likewise, reform-demanders were skeptical of Castro’s intentions. Castro needed to change those expectations. Hence, it was necessary to take bold steps, or at least, appear to be doing so. A clear example of this occurred in November 1993, during a visit of Rosa Diez, a trade representative from Spain and a leading figure in the ruling PSOE. Castro said: Cuba “must adapt to the reality of today’s world; the reforms are ‘irreversible,’” and “we’re creating an opening and we’re making it as broad as possible” (The Miami Herald, 11/5/93:18A). In reality, this was nothing more than an illusion. Cuba did not intend to go far on the reforms. Indeed, even as the reforms were being announced, enormous restrictions on each reform were being created. Thus, Cuba’s reforms differ from those of Latin America in the early 1990s in that the Executive never intended to pursue liberalization at all. The reforms were nothing more than a way to create the illusion that the government was going to reform, in order to placate a source of political pressure, and gain some political space. The second objective was to reward the duros within the government. The duros were opposed to change. The restrictions placated their opposition. It persuaded them that the reforms would not go too far. And more important, it gave the duros a privileged new role: gatekeepers to the “new economy.” I develop this point later. Another indicator that the Chief Executive favored the duros was the pace of reform after recovery. A true reform-minded administration, in which reforming technocrats have the upper hand, normally deepens the reforms once there has been some degree of economic recovery. Pro-reform sectors of the ruling party will use the recovery to argue that the reforms are working, and thus, it is necessary to do more. In contrast, an Executive committed to pleasing the hard-liners does the opposite, doing everything possible to decelerate, and maybe even discontinue some of the reform accomplishments. This is precisely what happened in Cuba. Once the economy began to recover (mid 1996), the government slowed down the reform process, reversed some existing policies, and never considered again seriously the most profound reforms (legalizing private property, liberalizing the labor market, privatizing stateowned enterprises) (see Pérez-López 2001). By January 1996, for instance, one of the hard-liners in the Central Committee declared: the party cadre “must form an ideological trench, impenetrable and indomitable, from which the Marxist ideology … can be defended and from which diversionist ideology can be countered” (The Miami Herald, 1/16/96). In the Spring of 1996, the government launched attacks against the intellectual community and political dissidents (The Miami Herald 5/2/96). Raúl Castro strongly criticized both the reforms implemented and even the Communist analysts advocating more reforms (Pérez-López 2001:51). In 1997, the size of the winning coalition is reduced further: the Central Committee of the Cuban Communist Party was purged, reducing its size from 225 to 150 members (Inter-Press Service, 10/13/97). And by 2000, the pace of approved foreign direct investments slowed down considerably, with the government increasing the amount of “trabas,” or bureaucratic obstacles, to the approval of new joint ventures (Travieso-Díaz and Trumbull 2002). Vice President Lage has also criticized the foreign trade zones, and efforts are being made to grant contracts to domestic state-owned enterprises rather than foreign corporations. The economic reforms transformed Cuba from a centrally planned economy to a state-capitalist economy. Students of Latin America’s political development should recognize this term. State-capitalism was the term used to describe the situation in Latin America prior to the 1980s, in which the state achieved dominance by maintaining a mixed economy. In Latin America, it became customary to speak of the triple-alliance: an alliance of the state, international capital, and domestic capital. More than at any other point since the 1930s, Cuba is now closer to this model, with one modification: there is no private domestic capital. Rather than a triple alliance, there is a double alliance between the state and international capital. Essentially, this has magnified the power of the Cuban state. To see this, it is important to look at the way in which the reforms have fragmented the Cuban economy. As Zimbalist and others point out, the Cuban economy is fragmented into three sectors, in increasing order of profitability: the old-fashioned statist sector, a growing informal market, and a joint state-private external sector (Zimbalist 2000). The old-fashioned statist sector is stagnant and contracting. The informal sector is growing, but as is the case with all informal sectors where property rights are not specified, its growth prospects are circumscribed. The joint state-external sector is truly thriving. A comparison of growth rates between industries in the statist sector (e.g., sugar) and in the state-private sector (nickel, tourism) shows how dramatic this divergence is. Whereas sugar production has essentially collapsed, nickel and tourism are thriving (see Table 2). Nickel and tourism are two of the most important recipients of FDI. The state is profiting from this arrangement in two ways. First, there is an economic gain (Jatar-Hausmann 1999; Kaufman Purcell 2000): the statist economy is living off of the profits of the state-external sector. The other gain is political, and it is more important. The state has emerged as the gatekeeper of the external sector. It, and only it, gets to decide which Cuban citizens have access to this sector. Access is reserved to core members of the winning coalition. Only friends of the communist party get recommended for jobs in hotels. The state keeps all Cubans away from tourist facilities, but rewards well behaved Cubans with packages in these resorts. The military, considered by some to be the most important pillar of the winning coalition, has been the primary beneficiary of this thriving sector. The military owns properties in the tourist sector, owns many joint ventures, controls key cabinet positions connected to the external sector such as telecommunications, and is in charge of reforms in the state-owned sectors (see Espinosa 2001). In addition, the state uses access to the state sector as a way to reward important citizens. Tourism supports 100,000 jobs in Cuba (Figueras 2001). Those in that sector can earn bonos or estímulos. The Cuban government gets to decide which Cubans can seek employment in these jobs, and can influence which Cubans get fired from those jobs. The Cuban state also manages to gain from the other two sectors, and to use them as a way to reward citizens. If you want to drive a modern car, have access to the Internet, travel freely and enjoy other pleasures, it pays to have a state job, since these amenities are only available in the formal state economy. Citizens who do not want to accept the low wages of state jobs and are not qualified to enter the external sector, can operate in the informal market. But even these citizens cannot escape the power of the state fully. First, as mentioned, the government retains monopoly over banks, exchange houses, and retail trade. Sooner or later, dollars transacted in the informal economy reach the state. Second, and most important, the government can hold citizens participating in the informal/illegal market hostages by being a selective enforcer of strict rules. Most informal market activities are illegal. Most of the time, as with prostitution, the state allows those informal/illegal activities to take place, but always reserving the right to enforce the law at any given moment, thus catching them by surprise. Citizens operating in informal markets can never discount the possibility of a crack down, and thus, live in constant fear. And they use resources in order to bribe representatives of the state, including members of the CDRs, to look the other way. Either way, the state manages to dominate citizens: by allowing informal activities while simultaneously threatening to intervene against them, state officials obtain enormous leverage over ordinary citizens. And because citizens now are somewhat better off than in the 1989-94 period (they have access, for the first time ever, to consumer goods through staterun stores, have the opportunity to try to get a job in the external sector, are free to have more contact with tourists and Miami relatives), they tolerate their misery better. The state succeeded in placating pressures for reform within and outside the ruling coalition, and still managed to the hard-liners in charge. There is no question that the reformers have been politically weakened, not just in terms of the extent to which their policies were watered down, rejected or reversed, but also in terms of their presence in the cabinet. A look at retirements during the post 1996 period makes this clear.7 By 2002, six of the 17 members of the 1993-96 class were retired, a retirement rate of 35 percent. In contrast, eight of the 21 oldguards holding office in 1996 retired by 2002, a retirement rate of 38 percent. Furthermore, three of these retiring old-guards were replaced by old-guardians themselves. If you include the number of oldguards who were replaced by old-guardians, the retirement rate of the old guard drops to 29 percent. One would expect that with time, older cabinet members would occupy fewer positions in any cabinet. In the Cuban cabinet by 2002, however, this is not the case. Due to their lower retirement rates, oldtimers predominate. The pre-1992 class holds 14 positions, including three of the four vice presidencies. The 1993-96 class holds 11 positions, and the remaining 9 are newcomers (i.e., individuals who entered in the 1997-2002 period). This cabinet continues to lean heavily toward the old timers. And if the suppositions of these papers are correct, by extension, it leans toward anti-reform ideas. The survival of old timers in the Cuban cabinet is simply remarkable, as remarkable as the survival of the regime itself. What kind of state is the Cuban state today? Rather than more open, the Cuban state is arguably more repressive, or perhaps, more capable of eliciting cooperation from society through the manipulation of inducements and constraints. Essentially, the Cuban state has created a new racket in the way it governs. This is how it works. The State is the entity that creates small market-oriented sectors, mostly those sectors open to FDI or transacted in dollars. These have become small pockets of wealth and growth in an island of relative poverty and economic stagnation. The state has become the sole gatekeeper of such markets, getting to decide who has access to them. Since 1989, US$1.3 billion in investments have moved in. This is a small figure relative to Cuba’s needs, but it is a significant amount of money when only one small entity, the Cuban Communist Party, gets to privatize most of it. The value of retail sales in dollars, all owned by the government, is not insignificant: it is estimated at 73.6 percent of the GDP (Ritter and Rowe 2002:107), perhaps one of the most dollarized economies in the Western Hemisphere. The state has also become the sole privatizer of the wealth generated or captured by these small market pockets (FDI, remittances, tourism, illegal cash bonuses to employees in tourism, fees for legal transactions, etc). And despite these huge earnings, the state remains as unaccountable as ever, due to the absence of mechanisms of horizontal and vertical accountability typical of non-democratic regimes. An important source of external accountability, the one provided by the IMF and the World Bank, is also inoperative because Cuba does not belong to either institution. Consequently, nobody really knows how large the dollar economy is. In some ways, therefore, this new state is more powerful than the centrally planned state prevailing from late 1960s to early 1990s. Under the previous model, there was only one economy: the state sector. All non-dissidents were guaranteed access to it. Because it was the “only pie” to be distributed among many, the value of each piece of the pie was significantly discounted. In the new economy, in contrast, the state distributes pieces from three different pies. The most valuable pie, the private-state export economy, is the one that is distributed among the smallest portion of the population: the winning coalition, and those members of the selectorate willing to be loyal. Hence, the state can offer a more valuable reward to loyalists than before—access to the most valuable aspect of the economy. It can also offer a more onerous punishment against dissidents—exclusion from the most desirable pie. The predominant incentive is for people “to leave the state peso economy” (Ritter and Rowe 2002:109). One exit is Miami. The other is to befriend a government official who controls access to the dollar economy. There is no question that Cuba’s new economic model is neither market nor socialist. It is not market economy because there is no freedom of association and property rights for citizens. You cannot have capitalists in the absence of a system of property rights, a labor market, and price freedom. It is not socialist economy either because the state is now the guarantor, in fact, the generator, of enormous inequalities: those with access to the thriving external market sector; everyone else is either a loser or merely a survivor. Because the state has taken for itself the role of deciding who gets to go into these sectors, it is directly responsible for the rise of inequality in Cuba. We can now understand the two puzzles with which the paper began. The combination of risk-taking and risk aversion is explained by the split in preferences within the winning coalition at the start of the reforms. The survival of the regime is explained by the state’s newly acquired capacity to distribute inducements and constraints by way of regulating access to small market pockets. More so than ever before, the payoff of being loyal to the state far outweighs the payoff of turning against the state. It is no wonder why Fidel Castro reiterates, as vociferously as he does, that he will not give up socialism in Cuba. He is reaffirming a commitment to a system that however unequal and inefficient, is quite efficient in generating loyalty and rewards within the winning coalition. It is easy to understand also why Fidel is not alone in Cuba in displaying preference for keeping things the way they are. Few Cubans gain from it, but those who count politically for the regime, gain the most. Opening: The state permitted transforming state farms into cooperatives, Unidades de Básicas de Producción Cooperativa (September 1993) and the emergence of farmers’ markets (October 1994). Restriction: The proportion of privately-owned land did not increase, staying at around 15 percent throughout the decade (Jatar-Hausmann 1999:73). What changed was the composition of the non-private agricultural sector. By 1997, 42.1 percent of land was controlled by UBPCs. UBPCs lack autonomy: the state still determines production plans, sets the price of products, and maintains a monopoly over the distribution of goods. State also retains monopoly over, and charges high prices for, inputs (e.g., fertilizers, fuels, pesticides, equipment, etc.) (See Mesa-Lago 2000:256). The state must approve which farmers can form or join a cooperative. Opening: Allow foreign direct investment (FDI) up to 100 percent (September 1995). By 1995 there were 200 joint ventures. More recently, the government has reported 370 entities with foreign capital (Placencia 2000). Restriction: Although foreigners are allowed 100 percent ownership, only one firm is 100 percent foreign owned. The rest of FDI occurs as joint ventures with the state. The state is keen on ensuring its own participation in these investments. The state explicitly bans ownership by Cuban nationals. States hold monopoly over hiring lists. Joint ventures can only hire from a list of candidates provided by the state. Marcos Portal, Minister of Basic Industry, declared shortly after the approval of the 1995 FDI law that hard currency salaries will go directly to the state for redistribution and assure fair job practices, with workers approved by organizations linked to the Communist Party (Associated Press, 9/6/95). Joint ventures are required to pay wages to the state (in dollars); the state then pays the workers in undervalued pesos, thereby realizing a huge profit as a result of this exchange rate distortion. These agencies retain approximately 90-95 percent of the payment received in dollars from the foreign joint venture and remunerate the workers in Cuban pesos. This violates Article 2 of Convention 87 of the International Labor Organization, banning the confiscation of wages and the interference with labor rights to choose employment (Travieso-Díaz and Trumbull 2002). In practice, private owners invest 50 percent and often lend the Cuban government 35 percent of the initial capital of a joint venture (Maybarduk 1999). A law decentralizing foreign trade allows state-owned enterprises to engage in import-export activities. Opening: De-penalization of dollar-holding (derogation of Article 140 of the Penal Code), legalization of formerly black-market operations; loosening of restrictions for Cuban citizens to receive dollars from the U.S. (July 1993). Restriction: State holds monopoly over dollar-transacted retail trade and exchange rate houses. The government opened approximately 275 shops where dollar holders can buy goods, thus capturing most of the dollars, especially those circulating in informal markets (Zimbalist 2000:18). Dollar-retail stores charge a sales tax of 140 percent on most products (Ritter and Rowe 2002). Very few goods are channeled to the peso/rationing based economy. Opening: Allow self-employment (Decree 141, September 1993). Restriction: From the start, the self-employed were banned from hiring labor, setting huge brakes in the capacity of these initiatives to expand. Further, the government restricted the type of sectors and professionals that could engage in self-employment. Cubans are still not allowed to buy and sell real estate or any other property. Concern about the boom in selfemployment began immediately (The Miami Herald 1/29/94). Already in January 1994, the Cuban government began to crack down on the self-employed: the government ordered closing of hundreds of private restaurants (paladares) and reduced licenses issued to run taxis and other vendors (The Miami Herald1/29/94). Fidel Castro said: “I do not really think one or two tables (at a private restaurant) will affect socialism…However, the man with 25 tables and 100 chairs is something else…imagine what it would be like if we gave him some space to fly.” Restaurants are permitted only 12 chairs and cannot advertise. Inputs have to be acquired from state stores. Paladares are banned from serving beef, fish, shellfish unless purchased in a state store, where prices are 20- 40 higher (Miami Herald, March 27, 1997). Inspectors were imposing fines of up to 1000 pesos for each chair over the limit (The Miami Herald 3/27/97). Private restauranters pay a tax of 50 percent on all revenues after deducting 10 percent for cost, amounting to an effective tax rate of 90 percent (Zimbalist 2000:22). Consequently, after peaking in mid 1990s, self-employed is a stagnant sector. Opening: The government proclaimed interest in promoting the “massive use of services and products related to information technology, communications, and computing” (http://www.cubagob.cu/). It even created a special ministry for this (Ministry of Computing and Communications, Decree Law 204). Restriction: Access to the Internet has been permitted “only where it directly benefits the regime” (Boas 2000:62). Email access is only permitted in the workplace, users typically share a single account, disallowing Internet cafes or connections in public libraries, no Internet Service Providers (ISPs). Only NGOs that are neutral or loyal to the regime are allowed access (ibid, p. 63). Cuba thus had one of the lowest levels of Interconnectivity in the Americas, despite its levels of socioeconomic development (53.6 users per 10,000 inhabitants, compared to 293.2 in Brazil and 1,155.31 in Chile) (see Corrales 2002). 1. This paper is part of a larger book manuscript on “The Politics of Economic Crises in Latin America in the 1990s” (in progress). 2. All data of cabinet changes drawn from Europa World Year Book (various years). 3. Mujal-León and Busby (2001) argue that during 1971-85 Cuba seemed to have been moving gradually toward to “post-totalitarianism.” Politically, there was greater institutionalization of political organizations such as the party and lesser dependence on Fidel Castro (see also Bengelsdorff 1994). Economically, the regime experimented in 1970s with Soviet-style forms of economic organization that granted more decision-making power to state enterprises, and in 1980-1985 went as far as to create farmer’s markets (see Mesa-Lago 2000). 4. In 1994, the government underwent a deep reform: some ministries and agencies were abolished or merged; others were created (Cubanalysis 2000). 5. One hypothesis could be that these cabinet changes were nothing more than a technical downgrading: i.e., an effort by Fidel to replace competent people with younger, easier to manipulate yes-men. On the possibility that the Castro brothers might be surrounding themselves with less-technocratic, more-acquiescent advisers, see declarations by Cuban defector Alcibíades Hidalgo, former adviser to Raúl Castro (El Nuevo Herald, July 28 and 30, 2002). 6. The most important symbolic political changes was reforming, or rather, rewording the constitution. References to Soviet-era terms such as the “Soviet Union,” “socialist community,” “scientific materialism,” etc. were replaced with less loaded and more Cuban-like terms such as nationalism, regional solidarity, social justice, Latin America and the Caribbean, José Martí, etc. 7. For a different view, suggesting that “there has been an almost complete changing of the guard a the ministerial level,” see Cubanalysis (2000). This report is impressed by the newcomers. I, on the other hand, focus on the resilience of the old guard, despite the passage of time.